“So what’s the deal with this Lemmy guy who trashed our Dark Force edition?” grumbled David George, Ural’s brand ambassador and marketing associate. I was hardly surprised to field such a question after reading our dear Lemmy’s opinion on the Star Wars-themed Ural, but had I walked into a new Cold War? A renewed standoff between Russian censorship and America’s First Amendment? Was I about to become an unwitting combatant in a new conflict over the freedom of human expression? Inside Ural headquarters. Photo by Alex Quinn. That was hardly the reaction I expected, and definitely not one you are likely to get from a corporate giant like Honda or Harley-Davidson. Ural headquarters is a different kind of place, however. The small office is home to 11 employees who define the brand across the globe. From product design to marketing and logistics, this tight crew of side-hack enthusiasts has dragged Ural into the 21st century through sheer will and perseverance. Parts to support Ural dealers worldwide. Photo by Alex Quinn. After a few jokes about Lemmy’s “Star Wars: Stupid” article and his “shoot-from-the-hip” editorial prowess, David was kind enough to give me a tour of the intimate facility in Redmond, Wash. I was astounded as he explained that it supplies parts for the international dealer network, an operation supported by one (yes, that’s right, one) employee. Just a few rows of shelves hold containers full of parts with handwritten labels reminiscent of now extinct library card catalogs. It is no surprise that Ural is all analog, but it is an impressive feat for a small logistics and pack-and-ship team of one to support hundreds of dealers across the globe. Assembly, R&D and maintenance are also performed in-house by a single employee. An analog operation in a digital world. Photo by Alex Quinn. With roughly 1,200 bikes coming out of the plant in Siberia per year, about half come to the United States, are assembled in Redmond, and then distributed all over the country. Only 25 of those bikes will be special editions like the Dark Force, MIR or Gaucho Rambler. These themed Urals are the result of an office brainstorming session each year and, to their credit, what they come up with is usually exciting... or at least amusing. The latest Dark Force was no exception and arose out of a desire to produce an all-black Ural and a shared love for Star Wars. The light saber was an afterthought. Built for land speed competition, this is the world's fastest Ural. Photo by Alex Quinn. Back in Siberia, the 130-person production facility is staffed by hard-working Russians, some of whom have worked at the factory for decades. Each bike is assembled and painted by hand, adding to the intimacy of the whole operation. Suggestions for improvement or changes coming out of Redmond are implemented almost immediately, a process that would be nearly impossible at larger manufacturers. 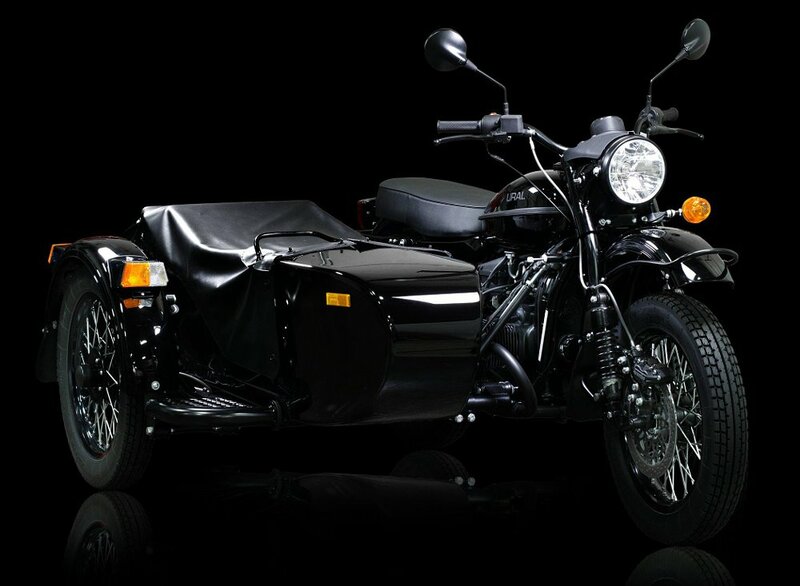 This allows Ural to continuously improve their already solid product. Urals on their way from the factory to owners. Photo by Alex Quinn. Lately, it seems like Ural is everywhere. From our own Common Tread articles (Camp Wandawega and Star Wars: Stupid) to press in national publications like the Wall Street Journal, The New York Times and Wired. These antiquated, three-wheeled, smile-inducing machines might not be the pinnacle of motorcycle technology, but in a world where most things are mass produced by computerized, automated production facilities, I find it comforting to know there is an underdog out there building bikes the old-fashioned way… by hand.